In this topic you will learn how to provide the ability for viewers to download specific videos from an in-page experience. If you want to allow all videos in the experience to be downloadable, these steps are not required. Gallery in-page experiences can be configured to display a download link allowing viewers to download video content. In-page experiences can be configured so that a download link appears for all videos or specific videos based upon a custom field value. 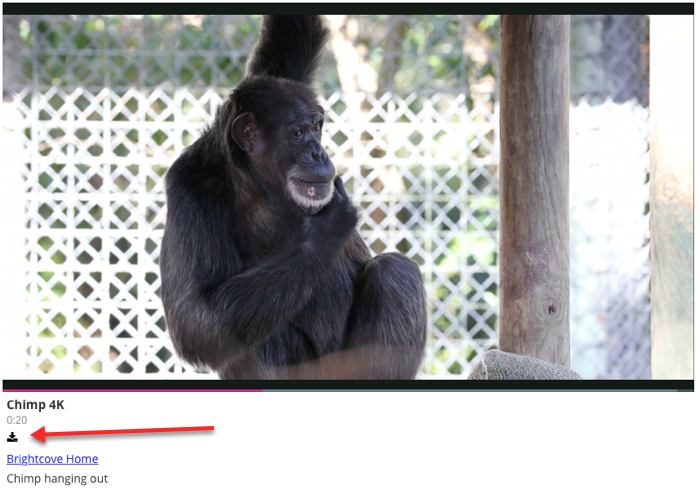 When a video is downloadable, a download link will appear next to the video. The highest quality rendition available is downloaded. Videos that can be downloaded are indicated by setting the value of a custom field. Start by creating a custom field in your account that will be used to indicate that a video can be downloaded. In the navigation header, click ADMIN and then Video Fields. Note that you must be an account administrator to access to the ADMIN menu. 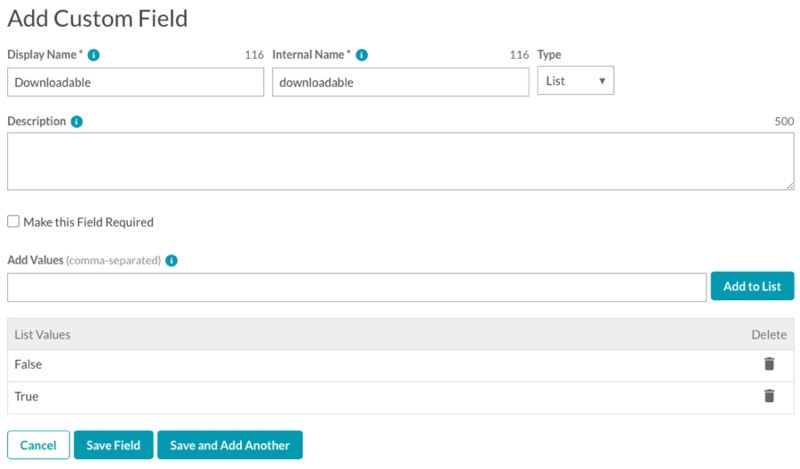 Create a new custom field that will be used to indicate whether a video can be downloaded or not. The name and value assigned do not matter. In the example below, a new custom field downloadable is being created. The Type is set to List, with 2 values, true and false. Videos that can be downloaded will have this value set to true as part of the video properties. Click Save Changes and then Save. Any video that can be downloaded should have a value assigned to the custom field that was created. To mark a video as downloadable, click on the video name to open the video properties. Locate the Custom Fields section and click Edit. Set the value of custom field as appropriate. In this example, the value of Downloadable is set to true. Edit the video properties for any additional videos as required. Note: Use the Quick Edit feature in the Media module to edit the custom field values for multiple videos simultaneously. To configure an in-page experience to allow video downloads based upon a custom field value, follow these steps. Locate your experience and click Edit. Click SETTINGS > Video in the left navigation. In the Video Downloads section, select the Provide a download link for each video based upon a custom field value option. Enter the custom field name and the value that you created in step 4 above. In this example, the custom field created was named downloadable and the value was set to true for videos that can be downloaded. Click Save and then republish the experience. Confirm that a download link appears for any video(s) that have the downloadable custom field set to true.